Defending women’s champion Nour El Sherbini overcame United States No.1 Amanda Sobhy in a tight four game victory to secure her place in the quarter-finals of the Everbright Sun Hung Kai Hong Kong Open, PSA World Tour Platinum tournament yesterday. 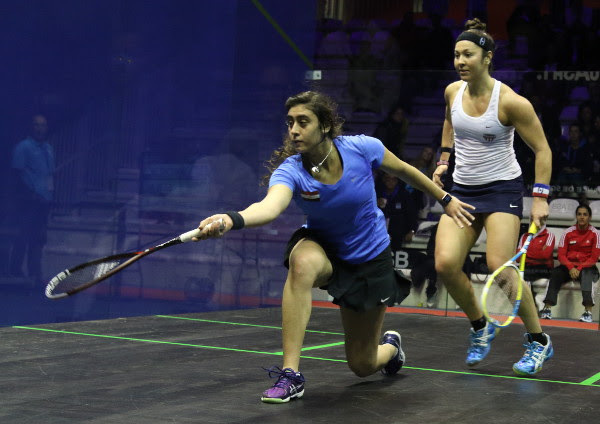 Determine to hold firm to the position, Nour came out firing as she swiftly took a two-game lead, only to see a resurgent Sobhy come back in the third game to halve the deficit. She, unfortunately, was unable to convert as El Sherbini came back to force a tie-break, before an error from Sobhy handed the win to the Egyptian. El Sherbini will be facing World No.6 Sarah-Jane Perry for a place in the last four after the Englishwoman mounted a superb comeback from two games down against in-form Welsh player Tesni Evans. Perry won the crucial third game and then took control against a tiring opponent to win 7-11, 15-17, 11-8, 11-3, 11-4 in 78 minutes, the longest match of the day. World No.2 Raneem El Welily has booked her place in the quarter-finals courtesy of a 3-1 triumph against England’s Victoria Lust from a game behind to win to set up a fixture with home favourite Joey Chan in the next round. World No.4 Camille Serme and Egypt’s Nouran Gohar were the other victors in the women’s draw. Serme ended the run of England’s Millie Tomlinson – who sent 10-time winner Nicol David crashing out yesterday – while Gohar got the better of World No.11 Alison Water.